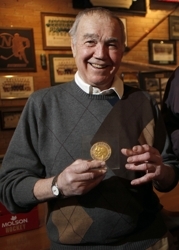 Paul Johnson was a senior on the 1952-53 Breck team that went 10-0 in the Independent School League. 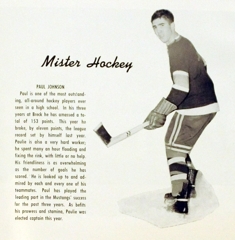 A 1953 Breck High School yearbook devotes an entire page to the exploits of senior hockey star Paul Johnson. The headline next to the feature photo of Johnson says “Mister Hockey” and the accompanying text proclaims Johnson as one of the most outstanding all-around hockey players ever seen in a high school. By all accounts, Johnson was as good as the author of that glowing yearbook article trumpets. He was Mister Hockey before they invented Mr. Hockey. 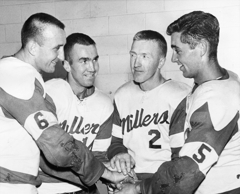 “He was the class of at least the Twin Cities and probably all of Minnesota at that time,” said Jack McCartan, a goaltender who grew up in St. Paul playing against Johnson. “When he was high school-aged he was the cream of the crop. Even before high school he was known all around the Cities. If there had been an award given to the state’s best senior in 1953 (Minnesota’s Mr. Hockey Award originated in 1985) it most likely would have gone to Johnson, a scoring machine who played everywhere and did most everything -- including shovel and flood the school’s hockey rink -- for undermanned Breck. Johnson was a youth hockey phenom growing up in West St. Paul, scoring at a torrid pace at every age level. He said he attended St. Paul Humboldt as a freshman, but was convinced to transfer to Breck by hockey-playing buddy Stan Hubbard, the son of Hubbard Broadcasting Company founder Stanley E. Hubbard. 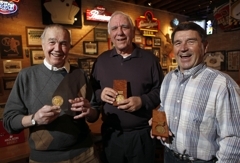 “He was exceptionally good,” said Bob Schmidt, who grew up playing youth hockey with Johnson. “He was a great skater and a great scorer. Johnson said he doesn’t recall ever leaving the ice during his three seasons with the Mustangs, when he scored a combined 153 points. 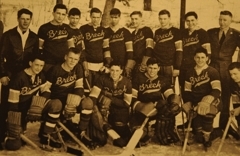 Breck won the Independent School League title in 1952-53 with a 10-0-0 record, snatching the championship from St. Paul Academy thanks in large part to the Mustangs’ two regular season wins over their rivals. 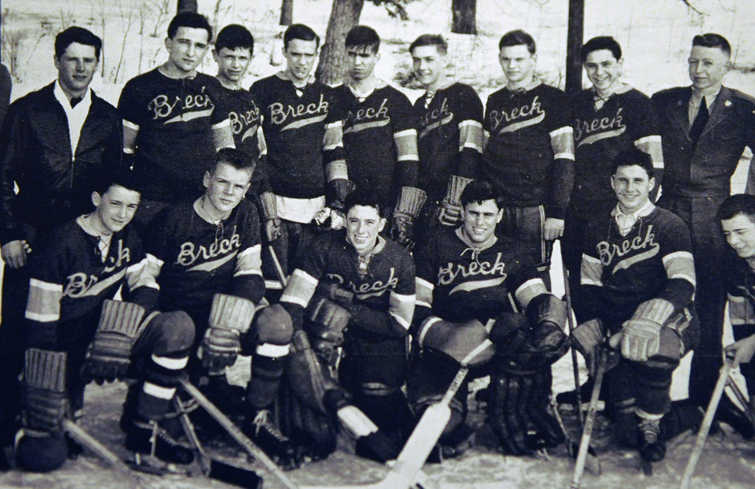 Breck opened the 1953 Minnesota Prep School Invitational Tournament with an 8-4 rout of St. Agnes. The Mustangs’ season – and Johnson’s high school career – then ended with a loss to St. Paul Academy. Johnson never played college hockey. 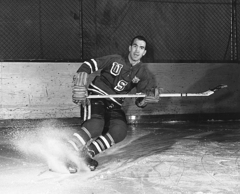 Before becoming a mainstay on the U.S. national team starting in 1958, he played for the Rochester Mustangs in the United States Hockey League. 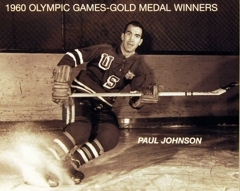 Johnson scored the winning goal on a breakaway in Team USA’s shocking 4-1 triumph over Canada at the 1960 Winter Olympics in Squaw Valley, Calif. 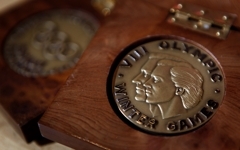 The team went on to win the gold medal, a result many consider to be every bit the “Miracle” accomplished by the 1980 U.S. team in Lake Placid, N.Y.
Goaltenders in particular never knew what to expect from Johnson, who rarely took the conventional route. 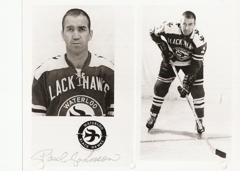 Johnson played 12 years of professional hockey, including a stint with the Minneapolis Millers of the International Hockey League. He was a top scorer as a pro, posting 218 points (118 goals, 100 assists) in 242 IHL games. 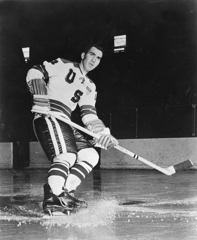 He played seven seasons with the Waterloo Black Hawks of the USHL before retiring in 1973. Johnson lives in the Twin Cities with his wife, JoAnn.